Tamarindo, Costa Rica, is one of the favorite places to stay for local and international tourists. There is so much to do, excursions to take and just about everything you’ll need on your vacation is right there. This bustling town has a lot to brag about. You’ll never go hungry in Tamarindo, Costa Rica, that is for sure. There are so many restaurant choices from burgers and chicken wings to fine Argentinian dining. Surely, there is a favorite dining choice for everyone in your travel group in this small town. After dinner, Sharky’s Sports Bar can keep your beer mug full and the cocktails flowing. 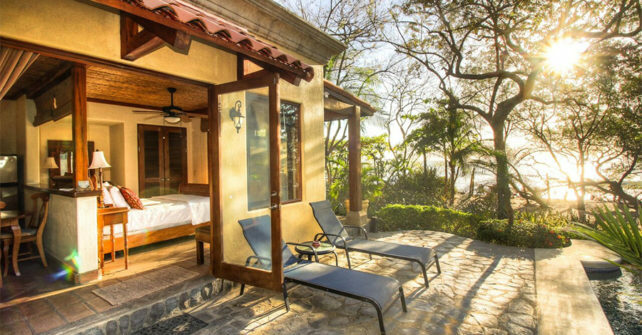 While the rates for private villas and hotel rooms might be a little high in Tamarindo due to the town’s popularity, there are nearby options. For instance, Casa de Luz is the perfect choice for groups of around 20 guests. Casa de Luz is a beautiful luxury villa that has its own private beach on the Pacific Ocean in Langosta. This villa is only 1.5 km from Playa Tamarindo, a quick walk either up the beach or by using the street. Tamarindo is the location where most tours are based, although there is a pick up spot in Langosta, as well. You will be within walking distance of plenty of sea fishing excursions, day tours by boat of the estuary, small islands and kayaking and numerous other adventures. Some tours will go farther out to visit coffee farms, the volcano, horseback riding and jungle zip line and canopy jumping. You can even find some wild river rafting! But some vacationers just relax on the beach to enjoy the sun and cocktails. This area has it all. When you need a place to stay to visit Tamarindo, Costa Rica, give Casa de Luz a call, especially if traveling with a group. You’ll receive great rates and your entire group can stay together in luxury accommodations.